With the recent boom of shale gas supplies in the U.S., many industry participants are pushing to export liquefied natural gas (LNG) to other countries where the prices are much higher. This effort has found new support from U.S. legislators as a result of Russia's annexation of Crimea and apparent efforts to regain control of all Ukraine. While the desire to send natural gas to European allies may be noble, it's certainly not a decision we should rush into. The U.S. has gone more than 30 years without a cohesive energy strategy and we face many domestic challenges in the near future. It is myopic to be calling for the U.S. to export its recent bounty overseas before serious planning and debate. The increased supply from shale gas in the U.S. is a new luxury. Let's not forget that the facility owners now pushing to export natural gas originally built those sites for imports only. That's because just five years ago our nation feared that we couldn't produce enough natural gas to meet our own needs, let alone those of other countries. This past winter saw enormous demand for natural gas as a result of 30-year low temperatures and a longer than normal heating season. Many suppliers were caught off guard having not secured enough gas to meet contractual needs and consumers witnessed gas prices soar. At the start of the winter the nation's storage reserves were expected to be between 1.6 and 2.4 trillion cubic feet (Tcf) by winter's end. They ended up at 0.8 Tcf, the lowest levels in over 10 years. We saw natural gas prices double over the winter even with our new supplies from shale gas; without it, prices could have increased 5-10 fold. Energy prices remain volatile and as a nation we need to remain vigilant with our policies. Recent environmental regulations have put increased pressure on natural gas demand from the power generating sector. Increasingly stricter greenhouse gas emissions and the new Mercury and Air Toxin Standards (MATS) have caused power plant operators to shut down numerous coal-fired power plants. With no new nuclear plants coming on line soon, suppliers continue to turn to natural gas which remains a much cheaper alternative to wind and solar power. Natural Gas has also felt increased demand from the transportation sector as fleets of trucks are being outfitted to run on LNG and CNG (compressed natural gas). Recent low prices have led to a rebound in the chemical, plastic, and rubber industries. Those factories consume natural gas in huge quantities. Finally, it's worth noting that we already send a percentage of our daily natural gas production to support Canada and the growing economy in Mexico. We are firm believers in free trade, but when it comes to U.S. natural resources we believe in caution and erring on the side of "America first." Our energy independence insulates us from geo-political events abroad, and low energy prices have a huge ripple effect in growing our economy. Sending our natural gas overseas may benefit a handful of export companies and be a nice symbolic gesture to our European allies. 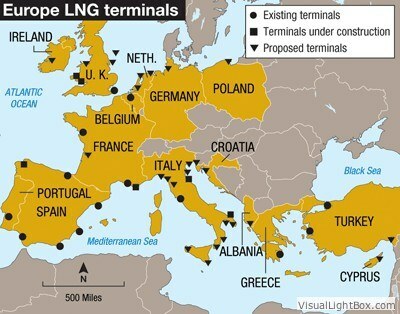 However, the unintended consequences would undoubtedly be higher natural gas and electric costs here in the U.S. Until the U.S. starts to rebuild its fleet of nuclear power plants and gets a decade of supply/demand experience with shale gas, it would be short-sighted to start massive exports of LNG to Europe or anywhere else.